What is Yoga, Kundalini Yoga and the Golden Link? 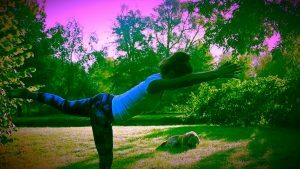 Yoga is technical know-how to bring equilibrium to the body and enable you to experience your Infinite Self. The word yoga means union or to yoke, as in the union to Infinite Consciousness, or the awareness that you are Infinite Consciousness. Its benefits are that by working with the body you can keep your mind on a level of consciousness that you choose; you can change the outlook of your mind; you can have the inner experience of Source; it gives your body flexibility and your mind neutrality. Kundalini Yoga is the technology of awareness. The Kundalini Energy is life energy latent at the base of the spine, which when moved up the spine towards the brain can bring total consciousness; the whole energy of the cosmos; the energy of consciousness; the creative potential of a human. Kundalini Yoga compares to other forms of yoga in that they are all ways to unify the Self. Of the 22 forms of yoga, Jappa, Shakti, Laya, Bhakti, Raja, Hatha and Mantra go to form Kundalini. This combination and their arrangement in each kriya (a set of precise actions that have specific effects) means that kundalini works faster than other yoga. Yogi Bhajan says twelve years of Hatha, plus six years of Raja, plus three years of Mantra, plus one year of Laya is equal to the effects of just one complete year of Kundalini. The main difference between kundalini and other yoga is that in one kriya you can reach complete physical, mental and spiritual balance. It is practical enough that householders who lead busy lives can practice it and achieve results immediately. Kundalini Yoga requires the spark of awareness passed on through the Golden Link to transfer consciousness from person to person. Also in Kundalini Yoga the teacher does not initiate, it is the yogi’s responsibility to initiate themselves. The concept of the Golden Link is that the wisdom is being transmitted directly with no interference. Kundalini Yoga requires a teacher in that it is the psyche of the teacher who teaches it. The Golden Chain is the chain of teachers forming a channel where the energy, wisdom and protection of the tradition flow through to students. Chanting “Ong Namo Guru Dev Namo” links all the teachers by consciousness. The chanting of this mantra at the start of each class protects students and surroundings. Guru means from dark to light or infinite teacher, the agent of change or catalyst of transformation that awakens spiritual knowledge. Dev Namo means I call on the subtle wisdom. The Adi Mantra is an ancient yogic mantra which instantly relates the yogi to the divine teacher within, and was used by Guru Ram Das and Yogi Bhajan. Bhajan said the guardian of the Aquarian Age was Ram Das. 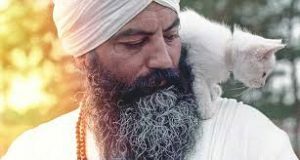 The Adi Mantra was how Yogi Bhajan stayed connected with his teacher Guru Ram Das, because Adi Mantra is a call that can penetrate through maya and essentially manifest the presence of Guru Ram Das. That way he could stay humble but strong in the knowledge that he was passing on pure Kundalini Yoga. I understand Dhyana to be meditation. I see asana practice as a form of meditation, also I see dance as meditation. There are many ways to meditate. Mantra, walking, creative flow, focus on another being or sun-gazing. Sun-gazing can also improve your eye-sight, as many people have attested. When I first started to meditate I would sit cross-legged on the floor with a straight spine and let my thoughts pass. Still acknowledge the thoughts, but then let them float away “like clouds in the sky”. Then I practiced walking meditation; stillness; and mantras. Then I studied Transcendental Meditation and continue a 20 minutes a.m. /20 minutes p.m. practice. It is effective in that there is less of a sense of being Time’s slave and more of a sense of calm through the day. I see Dharana as single pointed concentration. I can see how this overlaps with Saucha and Dhyana as they are all aspects of techniques for self realisation. When I was young I used to moon gaze and candle gaze until my eyes watered; I later learnt this was called Trataka. Also being in the flow of art and music feel like dharana to me. When you listen to people talk, or theatre, or poetry, if you can stay completely focused on the words, you are practicing dharana. When I teach – whether it is yoga to adults or creative writing to teenagers – I try to practice dharana, to concentrate fully on the students’ needs at that moment. When I was seriously ill I concentrated my attention on ways to get well efficiently. Probably in all aspects of life we have the opportunity to practice dharana. Saucha is purity, or cleansing. I understand it to be something that will help you to be open to universal consciousness. If we can cultivate purity then we have less obstacles to being in tune with the Truth of ourselves and the Infinite. Techniques and practices that support and cultivate Saucha are a clean diet, conscious nutrition; morning Sadhana; meditation to cleanse the mind of junk; pranayama especially good for cleansing the energetic body; and kriyas. For my Saucha I try seasonal fasts; cleanses; a forty day green diet; I eat a vegan diet (my main motivation for this is Ahimsa); and practice TM almost every day. I love pranayama and practice most days, though sometimes only 5 minutes. I also integrate pranayama to my Sadhana, as I have a cherished personal practice in kundalini yoga. Have a play with Dhyana, Dharana and Saucha and see what comes about for you! 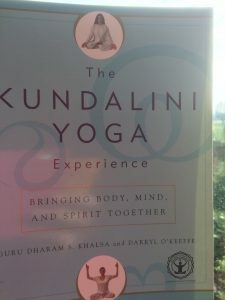 The title of the book is significant as kundalini yoga is about experiencing for yourself and tuning into the inner guru. This book is meant to be continually used over the years as the reader develops their own kundalini practice. Yogi Bhajan is acknowledged in the introduction as the man who brought kundalini yoga to the west in the late 1960’s. There is a brief definition of yoga and kundalini as its essence. In Part 1 the basics of yogic energetic physiology and numerology are introduced, the numerology based on the movement of the planets, relation of the sun to the earth and the effect it has on your life. It shows how to work out your numerology in relation to the ten bodies. so I found out that my Soul Number was 9; Karma Number 8; Gift Number 6; Destiny Number 7; and Path Number 6. Then follows a detailed look at the ten bodies: the Soul Body, Negative Mind, Positive Mind, Neutral Mind, Physical Body, Arcline, Aura, Pranic Body, Subtle Body, Radiant Body and the Embodiment. Three possible interpretations of the chakra system are offered: as a process of evolution; as a transformer of energy and as a system of esoteric instruction. The chakras are listed with their attributes and a chart for each, followed by a questionnaire to find out if all your chakras are balanced. Part 2 discusses the best way to go about preparing for a kundalini class. It is emphasised that group practice is preferable. It suggests practicing a Kriya for 40 days to improve negative traits; 80 days to implant a new positive habit and 120 days to seal it in your psyche. It also talks of a Kriya that could be the key to your lifetime, and if you find that Kriya then to practice it for 1000 days for self-mastery. Then it is offered that Yogi Bhajan’s suggested routine is followed to get ready for practice: cold shower, almond oil, white cotton, a sheepskin or rug and a pleasant environment. The ‘Amrit vela’ or ambrosial hour of dawn or dusk is recommended for practice as it intensifies the effect of the yoga, and we are more conscious of higher frequencies. It gives some warm up exercises and describes how a kundalini yoga class starts. Always the Adi mantra is recited at the start of the class “Ong Namo guru dev Namo” and the focus is taken inward to the third eye. Jalandhara bandh is held throughout and at the end of each exercise Mul bandh is applied. Between every exercise you relax with a straight spine to let the energy settle around the body and absorb the exercise. Part 3 illustrates Sat Kriya, which Yogi Bhajan recommends for everyone every day. He calls it a full body workout, as it massages the inner organs, strengthens the sexual system and increases energy flow, releases energy stored at the navel centre and it uses the bij mantra of “Sat Nam” Truth is my identity. For Kirtan Kriya meditation the thumb touches the Jupiter, Saturn, Sun and Mercury finger in turn as we chant Sa, Ta, Na, Ma. “Sa Ta Na Ma” is infinity, life, transformation and rebirth. The infinite cycle of life. Next in Part 3 there are kriyas for each chakra. it is fun to try and anticipate which kriyas are chosen for each chakra, using the information on the chakra charts to work out which asanas would benefit each chakra. For instance in the root chakra, kriyas that work the lower spine and deal with elimination are effective. For the second chakra kriyas that open up the pelvic area are effective. For Manipura kriyas that strengthen the navel point such as Nabhi Kriya are effective, and so on. Part 4 deals with components of kundalini such as pranayama, mantra, mudras, asanas with pointers for safe alignment. Breath of Fire and Alternate Nostril Breathing are also described. The mudras looked at are Buddhi; Buddha; Christ; Praying Mantis; Reverse Prayer; Shuni; Prayer pose; Gyan; Lotus; Surya; Venus Lock and Yoni Mudra. The bandhs are also described in detail: Mul bandh; Uddiyana bandh; Jalandhara bandh and Maha bandh. There is a useful glossary and some resources listed at the back. I found it an inspiring and useful book; it is one that I will often refer to over the years. Pranayama is the expansion of life force. It can be through different breathing techniques, exercises and through sun gazing. Fruits and raw food carry prana and we can direct our intake by our choices. Patanjali also says that it is through pranayama that we achieve the capability for true concentration (Dharana) the next step. There are different techniques for specific effects. On a physical level Pranayama can purify and restore. we can use it to cleanse the system and clear the chakras; we can use right nostril breathing to give us a clear focused mind so we don’t need caffeine, or we can use left nostril breathing to make us calm, relaxed or ready for sleep. We can use it to strengthen different organs and to increase the all round vitality of the body. Psychologically Pranayama can make us feel grounded and elevated, combined with mantra it can give us a strong sense of self, it can purify and restore the mind and open the heart. Through the practice pranayama can be directed anywhere around the body for restoration and strength. To test this out I practiced full yogic breath and full yogic breath with inhale retention for 30 minutes a day over one week. My shoulders felt more open, I was more stable emotionally and sure of my ground. Mentally there was more clarity. I practiced Nadi Sodhana, and equal ratios (square breath) for 30 minutes a day over a week. I felt balanced, my energy levels were more even, I had more of a neutral mind. I was alert and able to experience more intense feelings without being thrown off course. Pranayama is a powerful and beautiful technique. Gauge your own practice with awareness. As I understand the energy body from studying kundalini yogic philosophy: six of the Ten Bodies make up the Energy Body. They are the Arcline; Aura; Pranic Body; Subtle Body and Radiant Body. The Subtle Body is etheric, it is extremely close to the Soul, it is said that just after death the Subtle Body carries the Soul out of the body to the blue ethers. If the Subtle Body is strong, we are able to perceive the Infinite reality behind all things in the world; we are calm, have finesse and learn easily with intuition and grace; our movements are graceful and we are able to sense the imprint of all experience held in the Akashic Records. We have insight and mastery. We have tranquility, can see the unseen and know the Unknown. We are also able to sense long term and see the consequences of actions a long way ahead and have control of cause and effect. If the Subtle Body were weak we might be gullible, naive, easily misled or awkward, clumsy or crude in speech or behaviour; restless, misunderstood or frustrated. The Subtle Body examines the suggestions of the Soul: if the Soul suggests a certain action might be good, the Subtle Body will make refinements. a) Antar Naad Meditation “Sa Re Sa Sa, Sa Re Sa Sa, Sa Re Sa Sa, Sa Rung, Har Ray Har Har, Har Re Har Har, Har Re Har Har, Har Rung.” Where Sa is the totality of the Infinite and is very subtle, Ha is the creative force made manifest. This mantra connects you to the etheric realm and strengthens it in you. Also refines communication skills. b) Speak kindly and the Truth. We are what we say. d) Choose a meditation to practice for 1,000 days. f) Practice the arts and develop appreciation of the arts. Everyone can practice yoga, fully fit or disabled, young or old. Yoga is not a philosophy or religion, it is more a set of techniques, everyone is welcome to join in. Yoga can create extra space in your day where your mind becomes calmer and more efficient, your body becomes fluid, your spirit unfolds in bliss. If you are coming to one of my Oxford yoga classes remember not to eat for a couple of hours beforehand, as there are twists and some forward bends that don’t go well with a full stomach! While in class remember that you can always push your own practice further by stretching that little bit more, or continually scanning your form for micro improvements. Equally you can relax into child’s pose, or sit and breathe and meditate if you feel like it and join in the asanas again when it suits you. Always listen to your body with a kind ear and only go as far as you want to go. Yoga gives you the space in body and mind to discover who you truly are. It is a way of being which reminds you to take full responsibility for everything you do and feel. Yoga takes you to a new level of understanding, which is beyond what you thought was possible. It eases stress, pain, imbalance and responds to your unique needs. Through yoga you see that all the life force, fire, creativity and joy has always been and always will be there inside you. Yoga postures with equilibrium through stability and comfort. Moving meditation with effortless effort. Breathing exercises and cleansing to increase the pranic flow in the body. Preparing yourself mentally to increase the powers of the mind. Not letting distractions take you away from your path. Often by fixing the attention on one point or mantra. Through deepening concentration the normal activities of the mind slow down to an eventual place of stillness and silence. From Dharana the mind becomes free to spontaneously expand. This expansion of mind is meditation. This leads to a most subtle depth of awareness. The duality of mind is transcended and a state of pure awareness arises. This is the state of cosmic fusion where the finite has become infinite and Yoga (union) is attained. State of bliss, joy and merging individual consciousness into universal consciousness. Union between Jivatman and Paramatman. Union of Shiva and Shakti in Sahasrara Chakra. Thank you all who came for a wonderful retreat in the Algarve where we had two vinyasa yoga and one kundalini yoga practices each day; paddle-boarding; swimming and picnics on the beach; mantras each evening after supper, and an all round beautiful atmosphere. 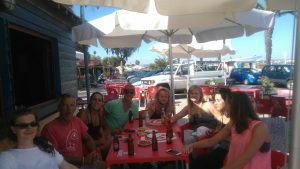 Thanks to Helena and Dan from yogaholidayalgarve and to Otto, Raoul, Nuno from kiteculturealgarve but most of all to Tinus, the little dog who rode with us on our SUP boards. Shout out also to Fifi, little dog at Butterfly House.